I'm so glad you stopped by for a visit today! A bit of Granny Chic, a pinch of Prairie, a sprinkling of rustic, a dash of Vintage and a Cherry on top. That's my CherryPrairie downhome recipe. You all may or may not know that I sew quite a bit. It makes my heart happy to create fun little prairie aprons, totes, blankets and all kinds of other goodies. I truly needed someone to model all these lovely little creations. But not just any someone, that just right someone. One day while I was out hunting treasures I came across Dottie at a yard sale. She was just right! She has a lovely worn look and is the perfect sewing sidekick for me. So now Dottie and I sew together (I do the sewing, she does the modeling). Dottie also loves dressing up for holidays. Here's a photo of Dottie all dressed up for Christmas. 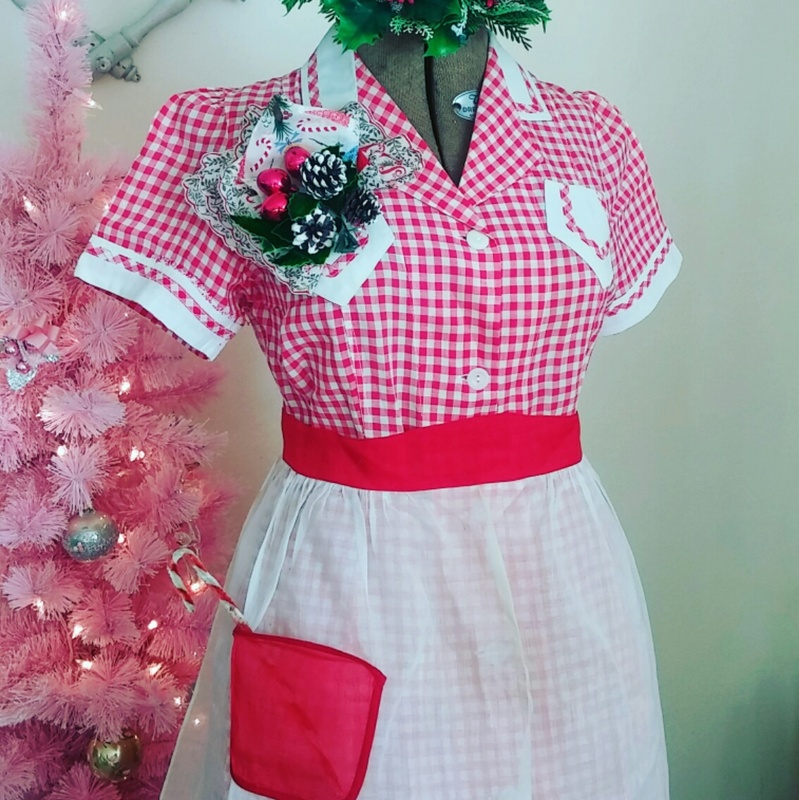 She's wearing a vintage waitress uniform with a Christmas hankie topped by a holiday corsage. And since every good waitress needs an apron with a pocket I let her borrow one of mine. Wishing you a happy new year with many treasures along the way! Early Autumn has arrived in my neck of the woods. Cold mornings, lovely afternoons and crisp evenings. At my house that means it's apple season. Visions of homemade apple pie, dumplings (with a double recipe of cinnamon syrup), apple cake and applesauce, just to name a few. That means it's time for me to cook up batch of homemade applesauce. I always use my Grammy's recipe. She canned enough applesauce each Fall to last her a year because she didn't like store bought. And you know she was right. Homemade applesauce is so much more flavorful. 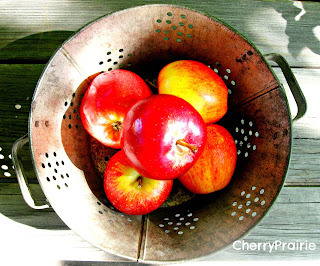 If you'd like to try making applesauce you'll find her recipe below. I don't can it like she did, I vacuum seal it in bags and store it in the freezer. Put all ingredients in a large pot, bring to a boil and simmer until apples are soft. Mash with a potato masher for chunky applesauce or puree with a stick blender for smoother texture. Let cool, and either vacuum seal or put in freezer containers. Store in the freezer. I always fill one mason jar and pop in the refrigerator to eat right away. I was taking pictures of some spoons to list in my shop. I added roses as an accent in the pictures. I wanted to keep them that way. added some vintage lace and a handmade tag. or wedding and use the tag as a place card. Hmm, maybe I should make more of these . . .
Sunshine and dry weather, finally!! After all the snow, rain and flooding blue skies are a very welcome sight. The Carson river reached major flood stage for the 2nd time this winter. We are fortunate to live in an area that was not affected. But there were road closures due to water on the roads/bridges and mudslides to the south of us. Many of the storm drains in town were full and bubbling water out into the streets. Thank goodness that's over and the sun is shining so everything can dry out. There may be more storms coming but for now there is Sunshine, blue skies and dry weather (happy dance)! 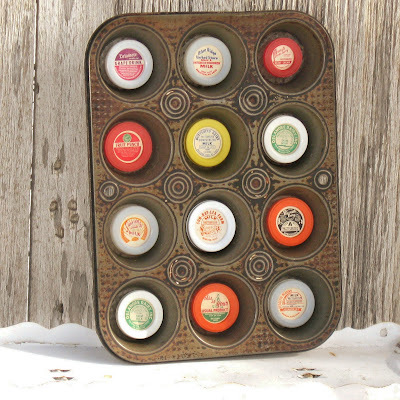 Are you looking for a farmhouse decorating idea using vintage items? This charming display works well in rustic, farmhouse and cottage decor. It's quick, easy and will add a unique touch to your home! 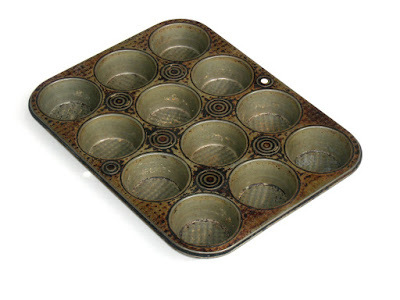 Start with a vintage muffin pan making sure that it is steel or iron not aluminum.This project won't work with aluminum since it is not magnetic. One with an aged patina will give your project vintage character. You'll need vintage milk bottle caps (both cardboard and plastic will work). One for each cup and as many strong round magnets. If you are not using peel and stick magnets you will also need a hot glue gun. Attach a magnet to the back of each bottle cap. Put one Milk Cap Magnet in each cup and you're done with your shadow box! 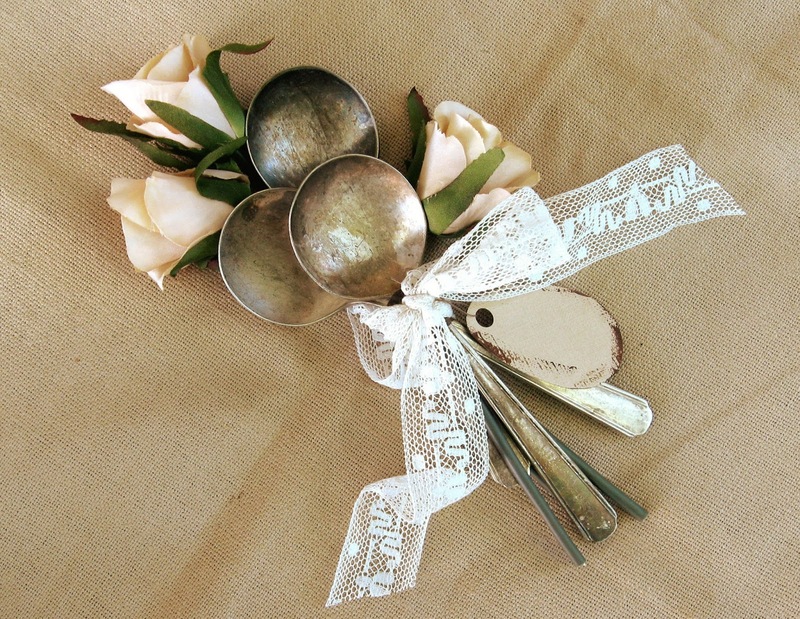 Add a hanger to use as wall art or prop it up against a wall, inside a cabinet or shelf. Display either vertically or horizontally, which ever works better for your space. Remove the bottle caps and use as refrigerator magnets. Your muffin pan will be undamaged and ready to use for something else. Visit my shop to see the muffin tin, milk bottle cap magnets and other goodies. I'm sipping a glass of sherry while admiring the Winter landscape and dreaming of sunny weather. The garden looks frosty and lovely while it sleeps beneath it's light blanketing of snow. A plant stand waits for Summer greenery. The fish hibernate in the pond while the vegetable garden behind it sleeps under a blanket of snow. A lonely chair sits vacant under the tree.